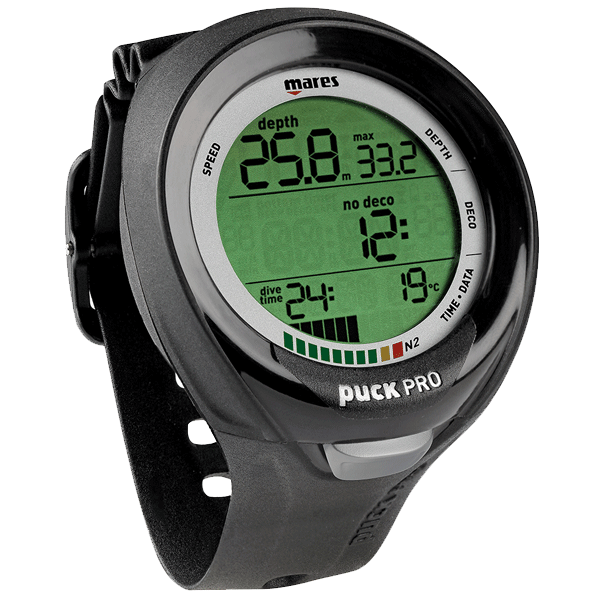 The Mares Puck Pro Plus is the new updated version of the popular Mares Puck Pro Dive Computer. It still has the same slim profile and single button operation divers loved about the old version but, is now upgraded with a few new features as well as a few visual aesthetics. However, with the normal puck pro is still available at a little bit cheaper price, is it worth getting the upgraded version? Let’sFind out in this Mares Puck Pro Plus Review. The Mares Puck Pro Plus is a large display entry-level dive computer that is slim on your wrist and sports an intuitive single button menu navigation. Large digits display your vital information in three different sections on the screen, so you can see how deep you are and how long you can stay there at a glance. Considering the price of the Pro Plus, it has one of the best screens in the business. The huge easy-to-read digits are separated into 3 sections on the screen making it easy to digest critical dive information. Bright backlighting also allows you to read the dive computer in any dive condition. The computer is operated by a single button located at the bottom of the computer that is easy to press even while wearing thick gloves. The user interface is very easy to grasp even without reading the manual. Simply press the button to cycle through menu options, then press and hold to select. The new Bluetooth PC interface allows you to download all your dive data directly to your PC or smartphone without the use of cables. However, the connector is not included but is reasonably priced when compared to the connectors from other brands. Unlike many competing dive computers, you have the option to upgrade the software with the latest Mares developments. However, this will require an uplink connector, whether it be Bluetooth or cable. A Slim profile streamline the computer, while large digits and segmented display makes it easy to read. It has all the essential feature a recreation diver will need. Plus 2 gas mixes for more advanced divers. A intuitive one button user interface makes operation easy and fool-proof. Competitively priced. Inexpensive choice for your first dive computer. The Mares Puck Pro Plus is very easy to setup and operate. As soon as you pick up the dive computer you can grasp the main concept of its operation without even picking up the manual. The segmenting of data on the display into three sections also make it quick and easy to interpret dive data. You know exactly where your depth is with just a glance. New Bluetooth uplink makes uploading your dives as well as downloading updates effortlessly. And, the fact that it cost just about the same as other competitors cable connection makes it a plus. Similar to all single button dive computer user-interface, there is no Step-Back feature. So, if you miss a menu option you will have to cycle through all the other menu options to get back to it, which can be annoying at times. Also, you cannot set a depth or bottom time alarm as these are not available on the computer. Similar to the Mares Puck Puck pro, this dive computer has been designed for divers just starting out or recreational divers who just want a dive computer that’s reliable and simple to operate. However, the Puck Pro Plus comes with some added features, including a little bit slimmer profile, color bar graph, and text to the inner ring of the screen, and of course Bluetooth capability. The Bluetooth connector is not included, so if this is not an important feature to you, then you should get the Mares Puck Pro since its virtually the same computer for less money. Where can get the Bluetooth Bluelink Connector? The Mares Puck Pro plus has all the features a new diver or recreational diver will ever need. Its simple one-button user interface and easy-to-read display make a superb choice for entry-level divers. It gives you exactly what you need nothing more. It might not have the bells and whistles of more expensive dive computers, but at the price point it is offered, you would be press to find another dive computer that offers more bang for the buck.